Happy Friday, blog world! Welcome to a made-by-Matt special post! Our world in the Thread Theory studio has been focused entirely around peacoats lately, so this week we wanted to immerse you in a bit of the inspiration behind the Goldstream Peacoat pattern that we are chugging away at! 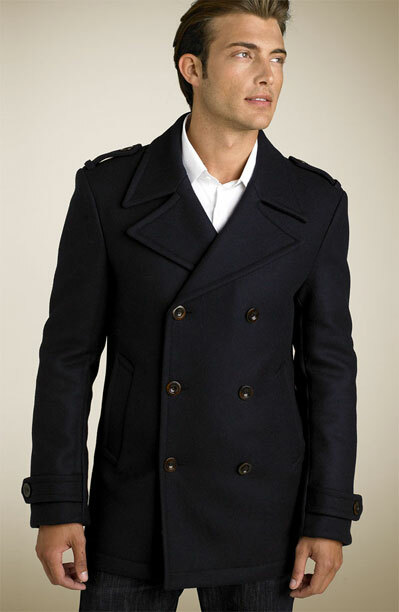 I think there is no outerwear, for men, more classic yet versatile as the standard issue navy peacoat. The history of the British Navy peacoat is fuzzy at best; there are many stories as to how it got the name and where it was first issued, but there is one thing for certain: The dense navy-blue wool double-breasted coat kept those sailors warm! The double-breasted front keeps the wind at bay (pun DEFINITELY intended), while the collar can be popped up and buttoned straight across the neck for the ultimate protection from the elements. The slightly shorter body was designed to allow for sailors to easily climb rigging while wearing the coat. This means that even in a nicely fitted jacket, sailors had full range of motion. Morgan and I are crazy busy with moving (we got the keys to our new place yesterday!) so this post is going to be short, sweet, and full of eye-candy! Morgan is currently in the midst of (hopefully) the final test-version of our pattern in a black wool with pea-green lining. She hasn’t decided yet whether to do gold, pewter, or black “fouled anchor” buttons (the anchor wrapped up in line); we’ll keep you posted! Like I said earlier, this is a short one! Our internet is getting hooked up tomorrow, which means I’m posting this using a mystery neighbour’s connection (sorry! We really can’t miss a Friday post!) which is spotty, to say the least. We’ll be adding more photos once we’re plugged in! This week, we would like you to comment on this blog post with your favourite tailoring, traditional menswear sewing, or jacket-related sewing techniques and resources! If your comment is relevant, we will enter you in a draw to win the Goldstream Peacoat pattern (or another pattern of your choice) once it has been released! The draw will close by next Friday, October 11th, and the winner will be announced in our weekly blog post! We hope to use your favourite resources (be them on-line classes, on-location classes, books, blogs, YouTube videos, or a technique of yours that you explain) to compile a Goldstream Peacoat sewing encyclopedia on our blog. Thank you in advance for all of your great suggestions! Feel free to suggest something even if you haven’t tried it yourself as Morgan will be investigating anything that is mentioned. Categories: Friday Posts, Guest Bloggers | Tags: Goldstream, inspiration, Peacoat | Permalink. The Designer will get the idea from your Peacoat pattern details. I am not designer but love to wear Peacoat to protect myself from winter. He also links to some good written instructions. I was fortunate enough to get my hands on this book through my husbands connection at the local University. Even though I only had it temporarily, I took so many notes it was ridiculous. Can’t wait to own a copy for myself, and can’t wait for this pattern… it looks amazing! I have followed Threads magazine which has many articles on sewing techniques. An Insider subscription gets access to previous articles. I have found it helpful when searching for info on specific techniques. I recently signed up for http://www.cutterandtailor.com/forum/ which is packed with tailoring information. I learned how to make a jacket in school and the number one thing I suggest is using horsehair instead of interfacing on the lapels and front pannels. Attaching these by hand gives the most beautiful result. You get all these little dots on the backside of the lapels, which give the garment a couture-feeling. In dutch it is called “pikkeren” wich resembles to a flannel stitch. It takes quite some time to do so, but it’s worth it! Making collar points using the thread loop method. Since I’ve learned this time-honored technique, it’s made my sewn shirts look so much more professional. No more home -made looking collars that roll funny! Lol! So you want a comment on tailoring jackets. I find that it is worth the time to catch-stitch the hem by hand. I’m so excited to see the pattern! My forays into menswear, so far, have been making dress shirts for my two sons. The book that is absolutely invaluable for that is David Page Coffin’s Shirtmaking, Developing Skills for Fine Sewing. I agree with many of the commenters on the articles found in Threads magazine–such a wealth of information in bite size pieces. The trick that I’ve learned, that has saved my sanity when putting buttonholes in my guys’ shirts with a one-step buttonhole attachment, is to turn the placket with the shirt front fabric to the left of the needle and start sewing the buttonholes into the placket from the bottom. It’s a bit counter-intuitive at first, as you are stitching upside down and backwards, in a sense. Then when you get to that top buttonhole, the attachment won’t get stuck trying to back up over the collar stand–I almost always had to redo that buttonhole at least once before I happened on this technique. Same for that fiddly collar stand buttonhole with all the layers–do it backwards! I do have my Jedediah pants cut out and ready to sew with the excellent sew-along instructions, but, I’m a new grandma and I’m not going to lie…I keep getting distracted with baby sewing ;-). Thankfully, I have very patient sons. Thanks so much for the giveaway–I would love to make this coat for my guys! My number one resource for men’s tailored garments is the book Classic Tailoring Techniques – A construction guide for menswear, by Roberto Cabrera and Patricia Flaherty Meyers. It’s a step by step guide on sewing a suit. Although the process is different for sewing a coat, the parts about interfacing, sewing pockets, lapel facings and collars is the same as for a coat. For a quicker version, like RTW, Threads Magazine has some great articles on where and how to interface jackets with fusibles. If you’re a Threads insider, it’s very easy to find them. I own the book “Tailoring, the classic guide to sewing the perfect jacket.” I really love it, the steps are shown in great detail and care is made to highlight ever construction technique and how to be precise. I’ve done a little bit of tailoring (I made a jacket for myself) but I have a grandiose plan to make my husband a suit. I have everything I need but the time and the nerve, at the moment. I’ve also been collecting tailoring supplies like a June Tailor board and a clapper. The clapper is actually great, I use it anytime I want a crisp, precise edge when pressing something. Your pea coat looks amazing, can’t wait to see more. Well, I’ve not sewn much menswear but I really like your designs. I would like to try them! I’ve heard really good things about this book and have checked it out, it’s good info “Shirtmaking by David Page Coffin”. (http://www.amazon.com/Shirtmaking-Developing-Skills-Fine-Sewing/dp/1561582646/) There is so much information out there and so many great tips in the comments. The internet is an amazing resource isn’t it? I am still pretty new to sewing for my husband, so I can’t give my favorite technique – but I will say that I have come to love (with all my heart) making button holes. 🙂 I love that there are so many buttons on this coat. My button hole cutter (chisel) would get such a workout. I like the eye candy for this post but I am not sure its up to par with your regular models. As for the buttons I think the pewter or black would look the best! 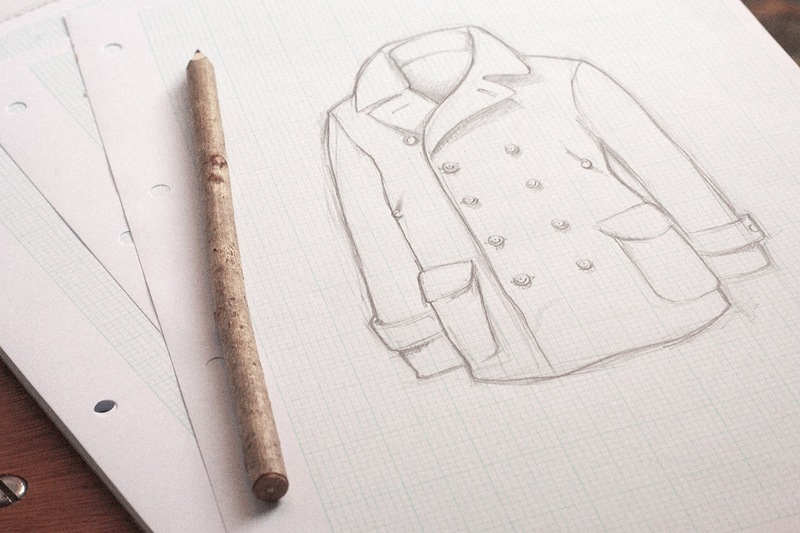 Love the blog and I am looking forward to seeing the final product of the peacoat. I haven’t done enough men’ wear sewing to have any other interesting techiniques. I’m thrilled that you are doing a peacoat pattern. There just aren’t any available in print. I don’t have much to say about them, other than that my husband was in the Navy and he loved his gov’t issue peacoat. If it hadn’t been destroyed in a plumbing disaster in his old apartment, he’d be wearing it to this day. As for buttons, current Navy issue has plastic buttons, but decades ago when he was in it was gold colored buttons for officers, and silver buttons for enlisted men. I think I’ve sewn one jacket for my husband, and it wasn’t a type that needed the tailoring that this would! I have no tips. I would probably research in Threads or the blog Male Pattern Boldness, mostly because that’s the only Men’s Sewing blog I know of! Love the patterns you guys have done so far; our men need more pattern attention. Looking forward to your printed patterns! I’ve never made a coat before, so I couldn’t give you any tips even if I wanted. What I can say is i’d check out Sawaholic’s sew-along for her Minoru jacket and use the Anise booklet for tips on making a coat. Ooh, and I’d make it a little more military by adding flaps on the shoulders, pewter buttons and making it in an olive green boiled wool. I’m drooling, here… can’t you see? I really love Gertie’s Book for Better Sewing, as she goes through a lot of tailoring techniques needed to make a jacket from setting sleeves to bound buttonholes! On an aside, I’m so looking forward to what the Goldstream Peacoat is going to look like. The illustration looks gorgeous! My favourite tailoring book is Tailoring:A step by step guide (http://www.amazon.co.uk/Tailoring-Step—step-Beautiful-Customised/dp/1845430573/ref=sr_1_1?ie=UTF8&qid=1380980121&sr=8-1&keywords=tailoring) It takes you through all the steps needed to make a coat or jacket. I’d love to make this coat for my husband. as great as hand tailoring is, it may not be for everyone. my favorite resource, and what i relied on for making myself a coat last year, is sherry’s “RTW Tailoring Sew-A-Long” (http://buzzybeesworld.blogspot.com/p/sew-alongs.html). sadly, she has quit blogging, but she has great tips for getting a professional finish on a coat or jacket. If there’s one thing I’ve learned about sewing menswear, it’s all about structure. So my number one suggestion would be to go out and get some real sew in hair canvas (hymo). If it’s not available in your area it can be found online. One source I particularly like is B Black and Sons. Making a tailored garment can be great fun, but it’s also time consuming. Using good tailoring supplies can make your results worth all the time and effort. I’m by no means a tailoring expert, but I try to demystify the process via my blog. I’m looking forward to seeing this pattern! I’m thinking bound buttonholes! I haven’t made them myself yet because I really only like them on outerwear and haven’t made any outerwear with buttons so far, but I’ve seen them on a lot of sewing bloggers’ creations and they’re always so pretty! My tip is to sew the long continuous seam around front edge and collar from hem to centre back on both sides – never keep going all the way around as it inevitably results in the second side lapel going wavy. Thanks for sharing. That looks really useful! Wow, that sounds amazing – can’t wait to get my hands on that pattern! I would loooove to sew my boyfriend a pea coat, all fancy with bound buttonholes (love them – they look so professional on a tailoring project). Good luck with your move and keep up the good work! It’s really eye-candy this post, can’t wait to see the grean-pea lining on a black wool coat… I would choose pewter buttons! Considering the only mens items I’ve made was your Newcastle Cardigan, and some t-shirts (from a BurdaStyle free pattern that I don’t particularly like – hence me buying YOUR Strathcona), I probably can’t help. I’m somewhat apprehensive about sewing menswear because all the tailoring tends to be on the outside, and I feel like I need to be just that much better than when sewing for myself. There are also very different fitting problems that aren’t addressed in any blogs, like his super wide shoulders, and trapezius muscles -> sloping shoulder? Oops the last comment had the wrong url attached for my blog. Sloping shoulders can be a problem for men. I can suggest that you look for patterns or if possible, adapt the pattern to use the raglan shoulder style which will perhaps look and fit better. I know nothing about sewing, but I have known a couple of men with sloped shoulders and I noted that they compensated by wearing raglan style shoulders when possible and it did look and fit better. If this is not good advice …. I expect Morgan will let me know. When cutting out jacket pieces, usually some will need interfacing. If you’re using iron-on interfacing, apply a piece big enough for the interfaced pieces on to your fabric then cut the interfacing and fabric as one (with it already ironed-on). This way you don’t have to try and match up the interfacing and fabric pieces after cutting – and no accidentally getting glue on your ironing board when they don’t match.